My first full day in Chicago began and I was hoping that the weather was going to be reasonable enough for me to walk around the city centre without melting. Over breakfast with some new Irish friends, they informed me that today was set to be one of the hottest days of the year so far. Undeterred but a little concerned about sunburn and dehydration I consulted internet favourite WikiTravel for some hot sight-seeing tips and it did not disappoint. 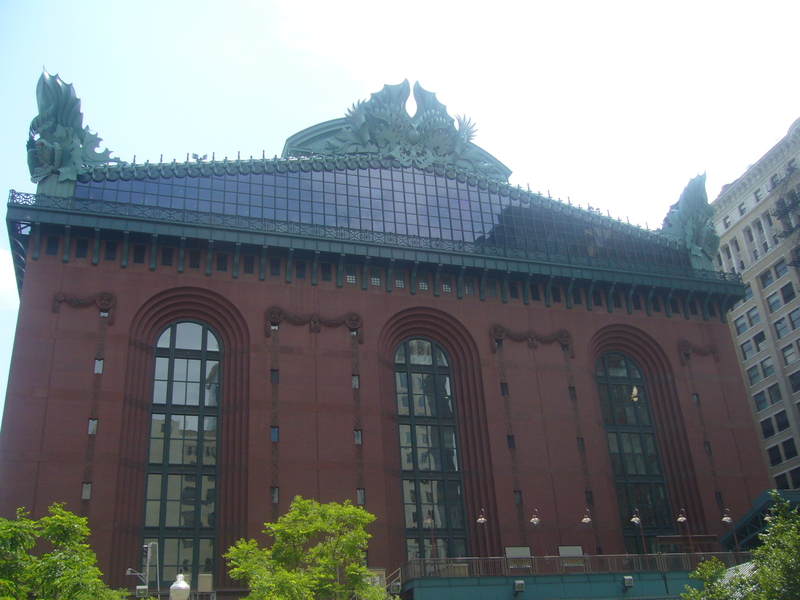 The site lists two walk-able tours of the city and I opted to take the Loop Art Tour. 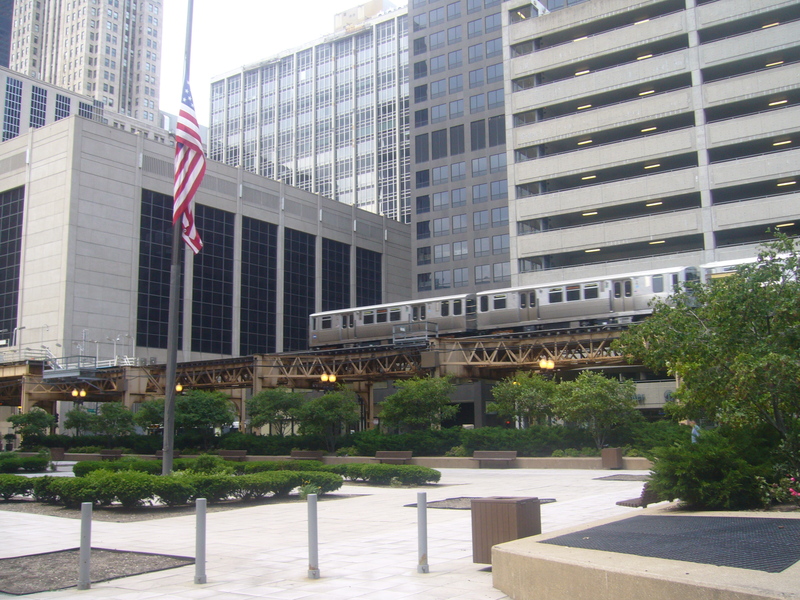 The Loop is the name given to the area that would otherwise be known as downtown, were it not for the “loop” of elevated trains that circle this part of the city. My first move was to walk into the city centre and as soon as I stepped out of the hostel and into the street I was immediately glad of my decision to throw on the whitest t-shirt I own and put two and a half litres of water in my rucksack. It was hot, and unfortunately in a humid way rather than in a “oh wow summer is here this weather is delicious” way. Fortunately, I soon discovered that Chicago doesn’t have the nickname “The Windy City” for nothing. I crossed a street and nearly took off as a strong cooling gust caught me by surprise. 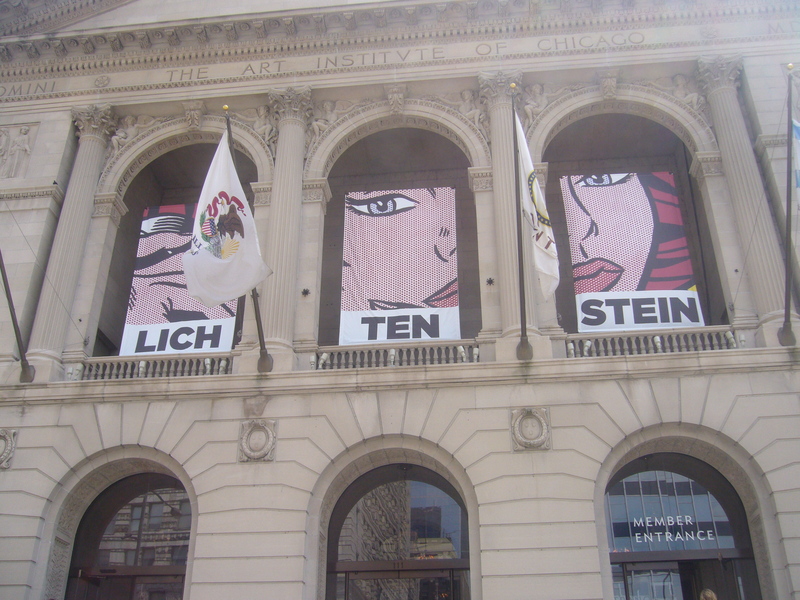 The beginning of the tour is the Art Institute of Chicago, upon arrival I noticed that through until September they had an exhibition on the works of Roy Lichtenstein, a personal pop-art favourite, and I made a mental note to come back here at another time to check it out. 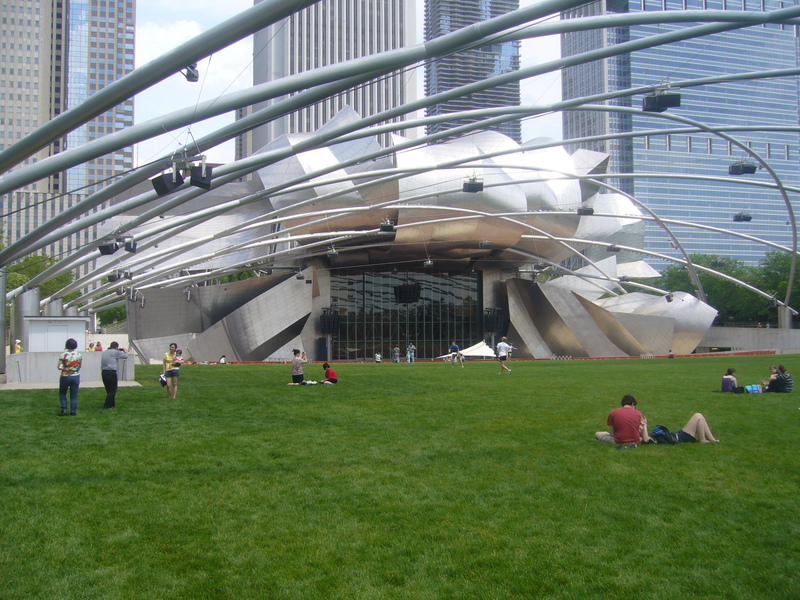 From the Art Institute it is a short walk to Millennium Park, home to some of Chicago’s most recognizable features. My entrance took me to Crown Fountain, which with the wind helped to create an invitingly refreshing spray across the side walk. 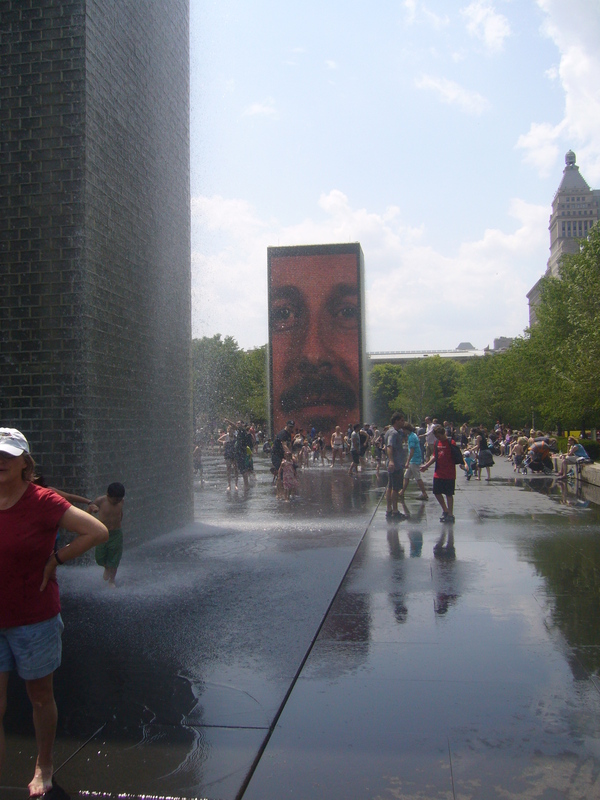 The Crown Fountain is made of two small tower blocks which have the faces of local people projected onto the sides that face each other with water rushing over each side. There were plenty of young families, children especially enjoying the escape from the relentless heat. There were also a couple of outdoor sculpture galleries near by and I checked them our, impressed by designs more tasteful than I had expected. 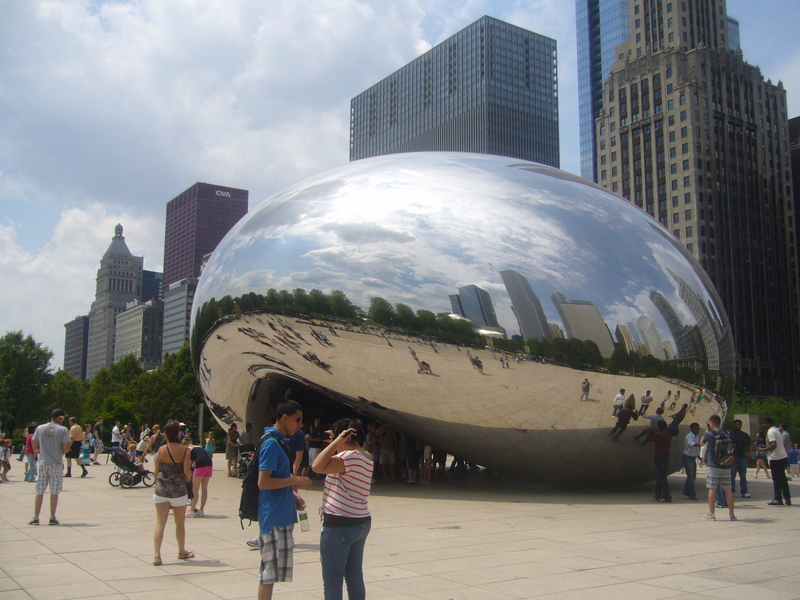 The next sight was the iconic and impossible to miss Cloud Gate which is better known as the Bean. I found myself both surprised and impressed by how elegant it appears considering it’s just an oversized mirror, reflecting the city and the tourist hoard. 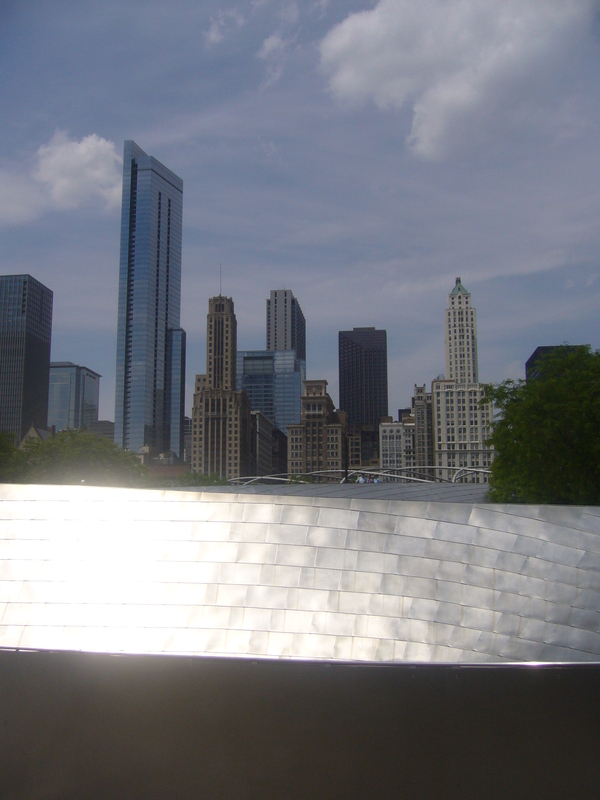 My tour took me around the Pritzker Pavillion, one of the coolest outdoor stages I have ever seen. It has an almost ugly, yet totally appreciable steel shell and a steel trellis spreads over the lawn supporting much of the stage’s sound system. It looked like it would probably be an excellent place to catch some live music. I then crossed Columbus Drive on the winding BP bridge which offers an excellent view back across the city skyline behind Millennium Park. The next leg of the journey was through the skyscraper lined streets. 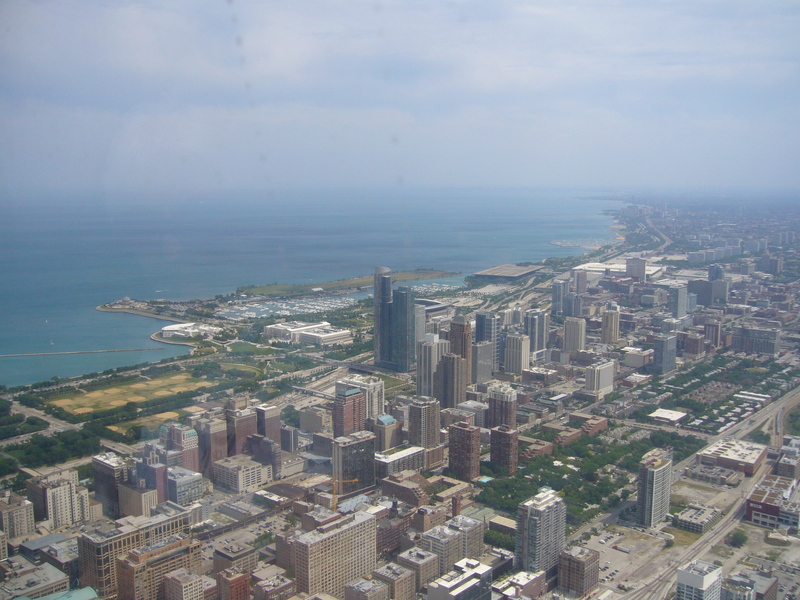 Chicago is on set out on a strong grid system which means you can look all the way down most streets to the horizon without an interruption, but can’t see anything around you due to the height of the surrounding buildings. 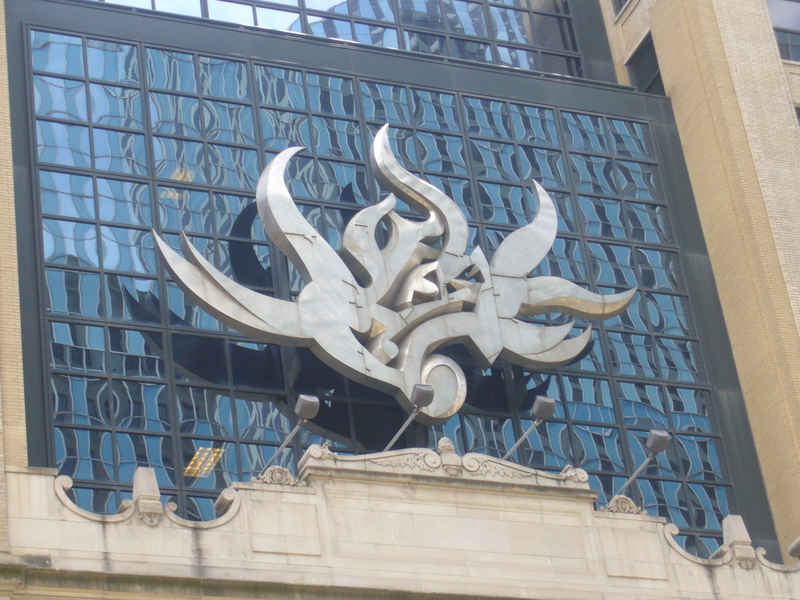 I found my way past the Chicago Theatre with the iconic Chicago sign, then the Thompson Centre and then I saw the massive flame-like Freeform sculpture by David Hunt stuck on the side of a building and almost three storeys tall. The next sculpture that I came across was the Chicago Picasso, the first of the monumental art featured in and around the Loop. I’ve never been much of a Picasso fan and this was no exception. 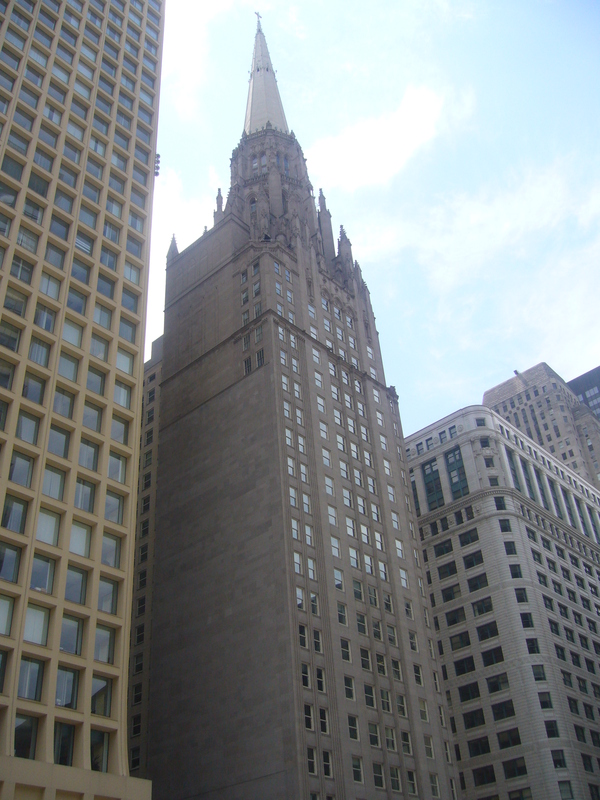 However, across the street is the world’s tallest church building; the Chicago Temple Building. A skyscraper church, and perhaps one of the few religious buildings I’ve taken any interest in after dealing with ABC of Europe. It is huge, and due to the grid system, almost impossible to get far enough away from to capture in full height. 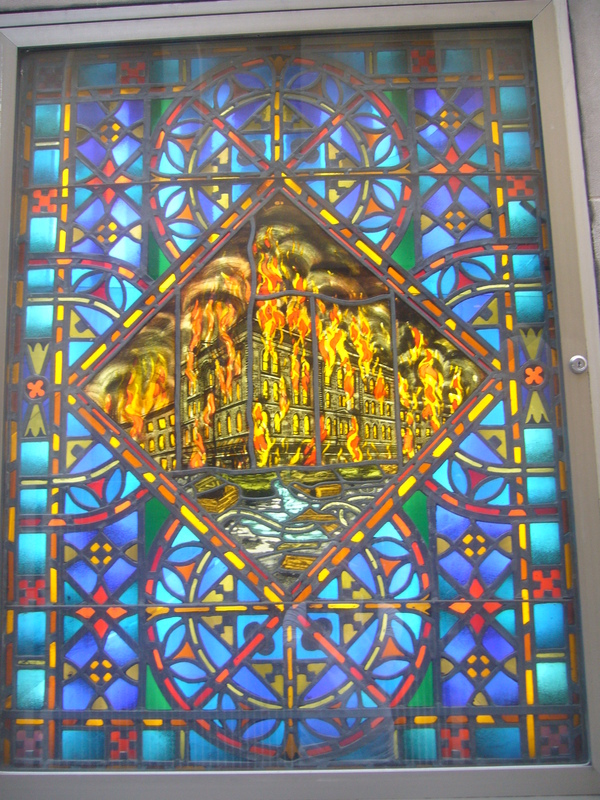 Along the east side of the building are a series of stained glass panels showing the history of the church and another piece of less-than-inspiring modern art; Joan Miro’s Chicago. 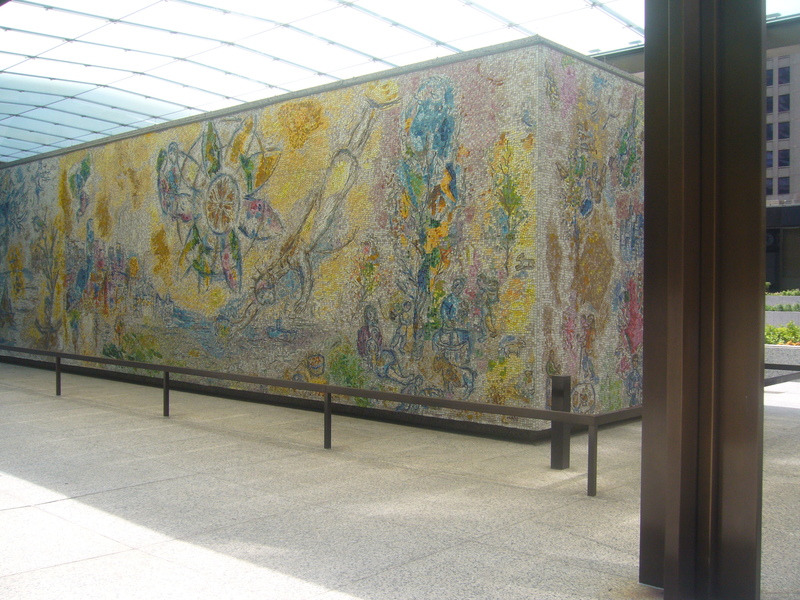 Next up was the Four Seasons, a seventy foot long mural and mosaic sunk into a large plaza. There were signs up everywhere around it demanding no skateboarding, and the local youth were more than happy to obey, instead opting for scooters roller blades. I then came across a sculpture that I can only hope was boarded up as it was soon to be removed; the Flamingo; an ugly, apparently regarded as graceful, construct of steel curving in supposed contrast to the sharp edges of the surrounding skyscrapers. There was another really magnificent building just south from the Flamingo but I can’t find what it’s called anywhere, but it had an incredibly decorative roof piece and that marked the end of my walking tour. 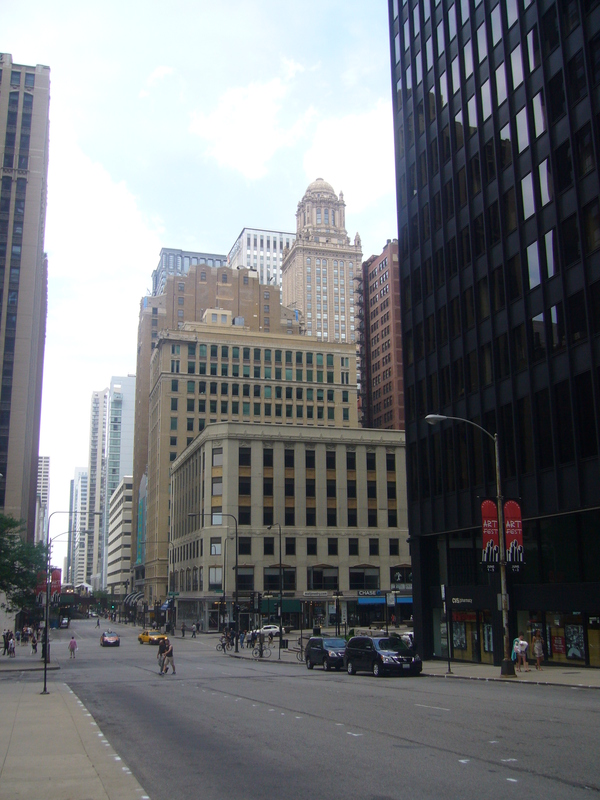 It is becoming rather common for me to find the biggest building in the city and go up it and Chicago has turned out to be no exception. The world famous Sears Tower as conveniently located on my way back to the hostel and the first thing I discovered was that it’s no longer the Sears Tower, but the Willis Tower! I don’t know how long it’s been like this for but everyone still refers to it as Sears so I will maintain the same. Unlike most of the other occasions when I have visited skyscrapers or towers, The Rockefeller Centre excluded, I had to queue to purchase my ticket to see the skyline from above. Fortunately, I decided to pick up a CityPass while I was at it and cut a massive chunk off my potential waiting time and approached the elevators directly rather than snaking through the lobby with those fools who hadn’t made the same investment. 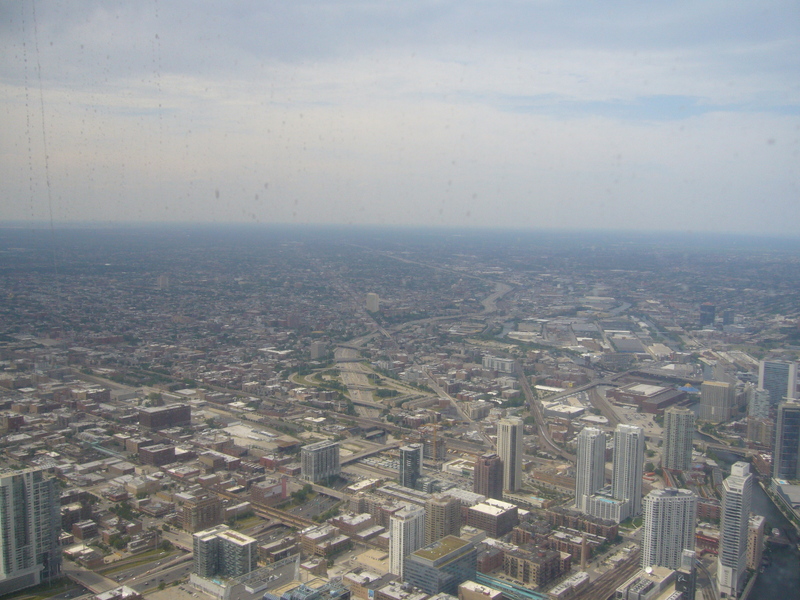 The elevator reaches the 103rd floor of the Sears in approximately sixty seconds, travelling at twenty miles per hour. 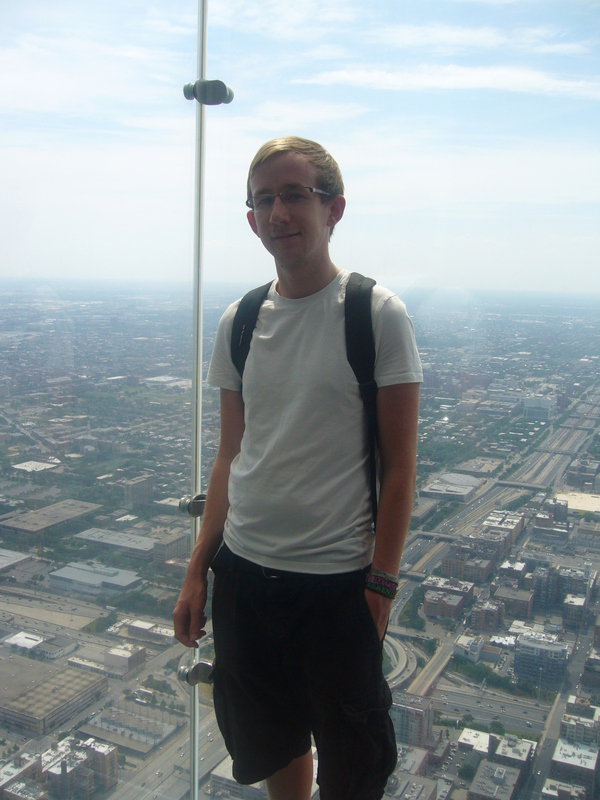 The views from the top are as expected pretty spectacular, and the Mid-West and Lake Michigan being so flat means that I could see for miles around and according to the information boards, across four states. 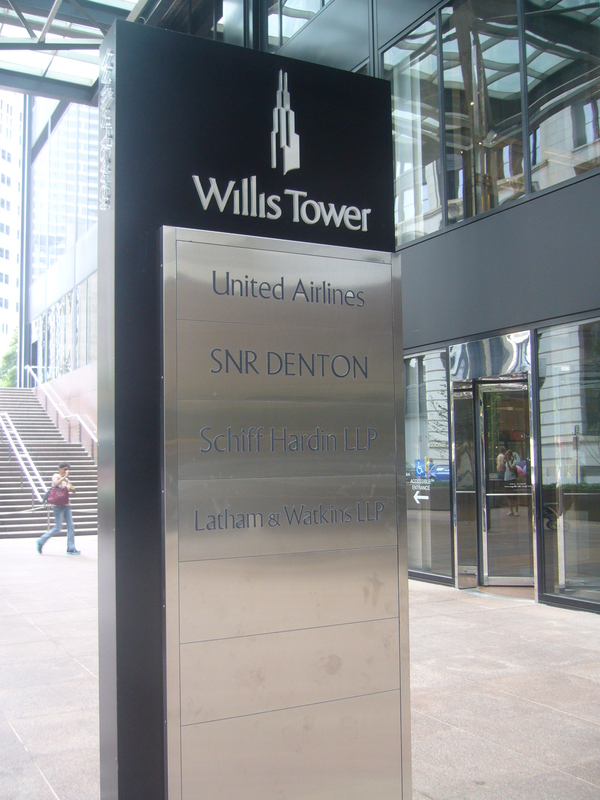 The added tourist feature at the top of the tower is the Skydeck, three glass boxes that protrude over the building with glass floors. 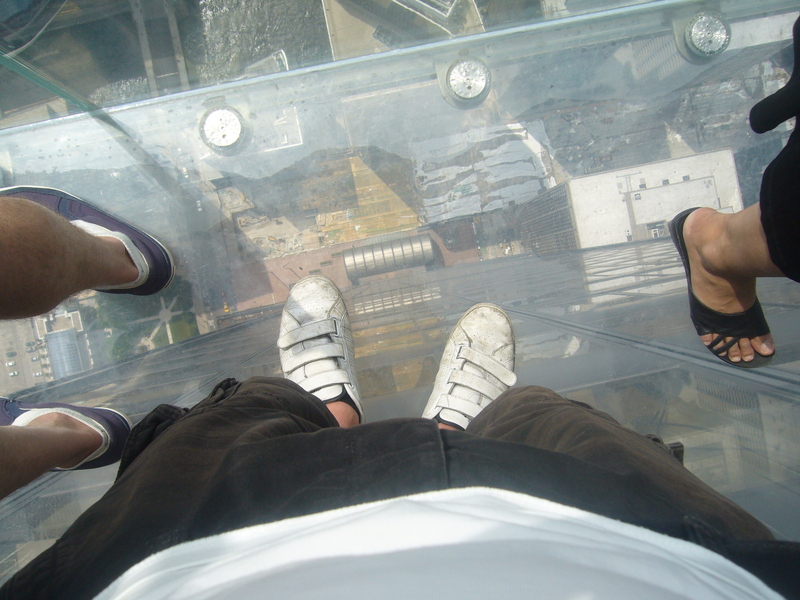 I’m not sure which is technically taller, but I found it much easier to walk out into the glass booths than I did to walk on the glass floors of the CN Tower. After a while enjoying the views I made my way back down, having to queue longer to leave than I did to get up. Once back on the ground floor and through all the gift shops I headed back to the hostel to escape the ever present heat. I’ve always wanted to go here! Looks great. Great pics! Will have to make it Chicago… some day!